Despite having reclaimed its independence from Somalia in over 25 years ago, Somaliland remains unrecognised by virtually every member of the international community – despite the fact that it has a functioning government, held a series of democratic elections and generally fulfills the broad criteria of statehood under the Montevideo Convention. As the country’s economy struggles to develop and its isolation does little to help lift the population out of poverty, concerns are growing over the status of women and the fragility of Somaliland’s relative stability in an area plagued by conflict and violence. UNPO urges the international community to officially recognise Somaliland as a nation and allow it to fully take its place in the world. When you are in Somaliland, there is never any question that you are in a real country. After all, the place has all the trappings of countryhood. When I arrived at the airport, a customs officer in a Somaliland uniform checked my Somaliland visa, issued by the Somaliland consulate in Washington DC. At the airport, there was a Somaliland flag. During my visit, I paid Somaliland shillings to drivers of cabs with Somaliland plates who took me to the offices of ministers of the Somaliland government. Even among unrecognised states, Somaliland is a special case – it is both completely independent and politically entirely isolated. Unlike South Sudan before its independence, Somaliland’s claim for statehood is based not on a redrawing of colonial borders, but an attempt to re-establish them. Unlike Taiwan, it is shackled not to a richer, more powerful country, but a poorer, weaker one. Unlike Palestine, its quest for independence is not a popular cause for activists around the world. The journalist Graeme Wood has described places such as Somaliland as the “limbo world”: entities that “start by acting like real countries, and then hope to become them”. What separates “real” from “self-proclaimed” countries is simply the recognition of other countries. There’s no ultimate legal authority in international relations that decides what is or isn’t a real country, and differences of opinion on that question are common. What separates the Somalilands of the world from, say, Sweden is that Sweden is recognised by its peers. Statehood may be a legal concept, but achieving it is an entirely political process. To the degree that foreign officials acknowledge Somaliland at all, they are generally sympathetic to its history and admiring of its recent accomplishments. Somaliland’s main obstacle is not the world’s animosity, but its indifference. Its current predicament answers the question: what would happen if you created a new country and no one noticed? Somaliland is pretty easy to get to. There are regular flights to the capital, Hargeisa, from Dubai and Addis Ababa. The city – a scruffy, sprawling town of cinderblock houses and potholed roads – feels coated in a fine film of desert dust. It’s usually extraordinarily dry, although periodic violent downpours in the rainy season leave the mostly unpaved streets damp and soggy. Camels are the traditional livelihood, food source and currency of Somali herders, and even in the big city, it’s not unusual to see them loping through busy downtown traffic. Food stalls crank out steaming, heaping plates of chewy camel meat (not bad) and thick, frothy camel milk (nauseating – to me, anyway). From other stalls, money-changers dispense grimy, faded bricks of shilling banknotes held together by rubber bands. When I was visiting, the shilling was trading at about 7,000 to the US dollar – although given that you can’t exchange Somaliland shillings anywhere outside Somaliland, I don’t exactly understand how this exchange rate is set. When paying for anything in a store with shillings, unless you know what you’re doing, it’s generally best to just hand over one of these bricks to the clerk and let him take out what he needs. Nowadays, most people are more likely to pay for basic goods and services by transferring cellphone credit. Try to book a hotel in Somaliland online from the US and you are likely to be referred to a travel advisory stating: “The US Department of State warns US citizens to avoid travel to Somalia because of continuous threats by the al-Qaida affiliated terrorist group, al-Shabaab.” But once you’re there, you quickly realise that such warnings are unnecessary. Hargeisa is one of the safest large cities in Africa, and, aside from the pollution and the traffic, there’s not too much to be concerned about when you’re walking around, although foreigners travelling outside the capital have been required to hire an armed guard since the killing of four foreign aid workers by bandits in 2004. There’s been almost no terrorist activity in Somaliland since 2008, when suicide bombers attacked the presidential palace and Ethiopian consulate. In contrast to the south, there is no pirate activity along Somaliland’s shores. Hargeisa’s main work of public art is a war memorial consisting of a stubby Mig fighter plane – a real one – shot down in 1988 and now mounted on a pedestal along the city’s main thoroughfare. Hargeisans will tell you, with some ironic pride, that their city is one of the few places in the world that was bombed by planes that took off from that same city. The event is part of a long chain of events, most of them tragic, leading up to the country’s strange current predicament. As the names of their countries suggest, there’s little ethnic or linguistic difference between the people of Somalia and Somaliland. The entity that today calls itself the Republic of Somaliland owes its existence to two main factors: its proximity to Yemen and its abundance of sheep. In the late 19th century, Britain (with the support of Italy) and France (with the support of Russia) were locked in a struggle for control of the Nile. As a means of both countering French influence and ensuring a regular supply of mutton for its garrison at the Yemeni port city of Aden, Britain signed a series of agreements with tribes in northern Somalia. In the words of the historian Ioan Lewis, “in relation to its size and significance” Somaliland was “one of Britain’s least rewarding possessions”. Yet there’s a good case to be made that its marginal status as a colony benefited the country in the long run. Whereas Somaliland had been considered a backwater by the British, and therefore left mostly to govern itself through the existing clan structure, Italy considered Somalia an integral part of its short-lived ambitions to build a north African empire that also included modern-day Libya and parts of Egypt. It shouldn’t be surprising that today the territory where the colonising power had more ambitious state-building goals is the more unstable. There is evidence from studies of regions of India and other parts of Africa to support the notion that postcolonial countries where colonisers had a lighter touch turned out better in the long term. As Somalilanders will often remind you, it was, in the past, an independent country, fully recognised by the international community, including the UN. But this halcyon period lasted less than a week. On 26 June 1960, the former Protectorate of Somaliland became fully independent from British rule, its independence recognised by 35 countries around the world, including the US. The next day, its new legislature passed a law approving a union with the south. On 1 July, Somalia became independent from Italy, and the two were joined together. It is a decision Somaliland has regretted almost ever since. Difficulties emerged almost immediately, and just a year after independence, voters in the north rejected a new constitution. The marriage was off to a rocky start. Things would go from bad to worse in 1969 when an officers’ coup brought a general named Siad Barre to power. The tensions within Somaliland society escalated as Barre’s long reign continued. Since independence, Somalia and Somaliland’s leaders have tended to favour members of their own clans and subclans with patronage. There are six main Somali clans, with dozens of subclans. The vast majority of those living in what is now Somaliland come from various branches of the Isaaq clan. The south is more heterogeneous. Barre may have espoused a doctrine of “scientific socialism”, a fusion of terrible governance ideas imported from China, North Korea and Nasserite Egypt, but he was not above ethnic nationalism, privileging his own Darod clan, which added to the resentment of the northern Isaaqs. During the 1980s, with support for Barre and his harsh military regime eroding, a primarily Isaaq northern rebel group known (somewhat misleadingly), as the Somali National Movement (SNM) emerged to challenge rule from Mogadishu. The crackdowns that followed simply added to the perception that the north was a region under occupation. This culminated in an all-out civil war between the SNM and the central government in the late 80s, during which thousands were killed and millions fled. On 18 May 1991, the SNM proclaimed that the region was re-establishing its independence, severing its ties to the south, and would now be known as the Republic of Somaliland. The world, for the most part, shrugged. The slow and steady process of state formation in the north would be almost entirely overshadowed in the international media by the chaos engulfing the south, particularly after an international intervention two years later led to the infamous “Black Hawk down” incident and the killing of 19 American troops during the battle of Mogadishu. So why has Somaliland been more successful and stable than its southern neighbour, even with virtually no assistance from the international community? The fact that is is largely populated by only one clan has helped it avoid tribal conflicts, unlike some other countries in the region. Most Somalilanders also point to the role of clan elders. In addition to a president and a traditional elected parliament, Somaliland has an unelected upper house of elders, somewhat similar to Britain’s House of Lords, which has a consultative role on certain legislation and is entrusted with settling disputes between the country’s subclans. 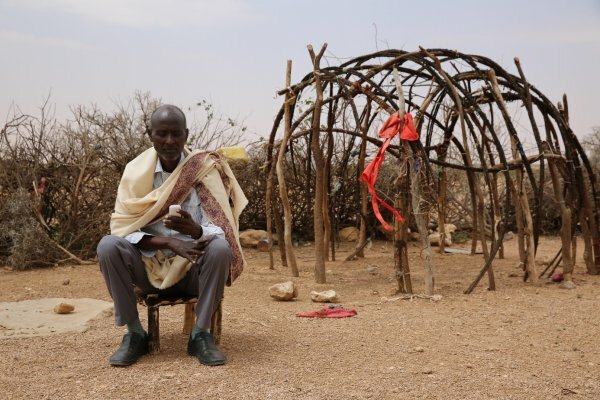 “It’s the elders who really made this peace,” Mohamed Omar Hagi, a UK-based Somali activist, told me. Adan’s office was decorated with photos of dignitaries she has met, from Hillary Clinton to Kofi Annan. The centrepiece was a striking photo of a very young Edna with her late husband, Mohamed Ibrahim Egal, at the White House with Lyndon B Johnson in 1968, when Egal was prime minister of Somalia. Adan was Somalia’s first qualified nurse-midwife, and the first Somali woman to drive. She spent years as a UN and WHO official before returning to Somaliland to build the hospital with her own savings; for all its limitations on personnel and equipment, it is one of the premier facilities in the Horn of Africa. She’s been called the Muslim Mother Teresa for her work in promoting women’s health and campaigning against female genital mutilation. She also served for several years as Somaliland’s foreign minister, continuing to deliver babies while on the job. Although her political activities receive less attention than her public health work, Adan is also a tireless advocate for Somaliland’s independence. “For 25 years I’ve been waiting for the world to see how stable, peaceful and governable we are,” she told me, decrying what she called the “world conspiracy against Somaliland’s recognition”. Adan sees Somaliland’s unrecognised status as the main reason for its lack of economic progress over the past quarter-century. She echoed a theme I heard a lot in Somaliland, that the country is a rare beacon of stability in a very dangerous region. Somaliland is indeed stable by local standards, but it’s not exactly prospering. Reliable statistics are hard to come by, but, in 2012, the World Bank estimated its GDP per capita at just $348 (£267), which would make it the fourth-poorest country in the world. Its main industry is livestock export, which accounts for about 70% of jobs. Its main customers are in the Middle East, and business picks up during the annual hajj in Mecca. With few opportunities at home, it’s not surprising that an estimated 44% of unemployed youth have stated their intention to migrate. The twin hopes for the Somali economy are oil exploration – currently being carried out by a handful of hardier energy firms off the coast – and a plan by Dubai Ports World to develop the Red Sea port of Berbera, which could conceivably be an alternative means of bringing goods by sea into landlocked Ethiopia. But it’s hard to imagine that plan taking off without a serious improvement in roads and infrastructure, and that probably requires international investment. And for that in turn, once again, it would be helpful for other countries to know that Somaliland exists, and isn’t the same country as Somalia. Although it’s true that Somaliland voluntarily erased the border with Somalia in 1960, Somalilanders don’t consider that decision irreversible. As Somalilanders often point out, theirs wouldn’t be the first country to back out of a postcolonial merger. Senegal and the Gambia, a narrow strip of a country located completely within Senegal’s territory, were joined together as the confederation of Senegambia from 1982 to 1989. Egypt and Syria were briefly joined together as the United Arab Republic from 1958 until 1961, when Syria seceded. If these countries couldn’t make their marriages work, why, Somalilanders ask, should Somaliland be stuck in a loveless alliance? These arguments were hard to argue with in Hargeisa. But in the outside world, they’re unlikely to prove persuasive. For Somaliland, the frustrating reality is that the world map is preserved in place less by international law or even custom than by what’s sometimes called “path dependence” – the thousands of small decisions that, over time, lead to the creation of institutions, and that are very hard to unmake without massive disruption. Countries tend to stay the way they are, and people, with some justification, believe it would be awfully difficult and dangerous to change them. The last major wave of country creation took place in the early 1990s as the end of the cold war hastened the breakup of the Soviet Union and the explosion of Yugoslavia. Since then, only a handful of new countries have joined the club – and many of them have struggled. The argument against Somaliland’s independence rests largely on factors beyond the country’s control. Somaliland officials are used to hearing that if their independence were recognised, it would set off a domino effect for nationalist movements, destabilising the continent. If Somaliland were independent, what would stop other regions from trying the same thing? International organisations such as the African Union and the Arab League are hostile to the idea of recognising further territorial divisions. Countries wary of their own separatist movements don’t want to establish any sort of precedent. The UN, which has invested enormous resources in promoting stability and unity in Somalia as a whole, views Somaliland as a hindrance to those goals rather than any sort of beacon of stability. Somaliland’s neighbour Ethiopia mostly supports it, but given Addis Ababa’s wariness about its own Somali separatists, it likely prefers the status quo – a weak and divided Somalia – rather than a strong independent Somali state on its borders. The two most recent instances of country creation in Africa – autocratic, impoverished and anarchic, violent – have not bolstered Somaliland’s argument that its recognition would be a boon to regional and global stability. Western observers, both governmental and non-governmental, have generally been more positive. Noting that Somaliland, unlike most of its neighbours, has had several contested elections and peaceful transfers of power since independence, the US NGO Freedom House classified it as an “emerging democracy”, and it is the only country in its region considered at least “partly free” or higher on the group’s annual rankings. As far back as 2003, the International Crisis Group argued that the choice facing the international community was to “develop pragmatic responses to Somaliland’s demand for self-determination or continue to insist upon the increasingly abstract notion of the unity and territorial integrity of the Somali Republic”. In 2007, a US defence official as “an entity that works”, and said that in the Pentagon’s view “Somaliland should be independent”. But even if non-African governments are, on the whole, generally sympathetic to Somaliland, it’s not enough of a priority to upset the status quo. Somalilanders like to joke mischievously that they have been too well behaved. After all, the other countries that have gained recognition in recent years have done so after wars and genocides. They are joking, of course, but without some major turning point or dramatic shift in global priorities, it’s hard to see Somaliland winning recognition. The world will continue to defend an abstract principle of territorial integrity in the face of the clear will of the people of Somaliland. Recently, there have also been some troubling indications that Somaliland’s much-vaunted peace and stability might be more fragile than it seems. Dozens have been killed in fighting between Somaliland and Puntland – a neighbouring semi-autonomous region of Somalia – as part of a long-running clash over a disputed border region. Monitors have warned that the conflict risks breaking out into open war. The Somaliland government has also been condemned for detaining and harassing journalists covering the conflict. For all its serious problems, though, it is hard to argue with Somaliland’s relative success. Perhaps this is the bigotry of low expectations, but whatever negatives you can say about the place, it’s not Somalia. With little help from the outside, Somaliland has had to do an awful lot on its own, and arguably done it better than many of its recognised counterparts.